Tata Tea’s Jaago Re campaign has been a long-running, ground-breaking initiative and the marketing team continues to reinvent it to create compelling movements targeting important social issues. 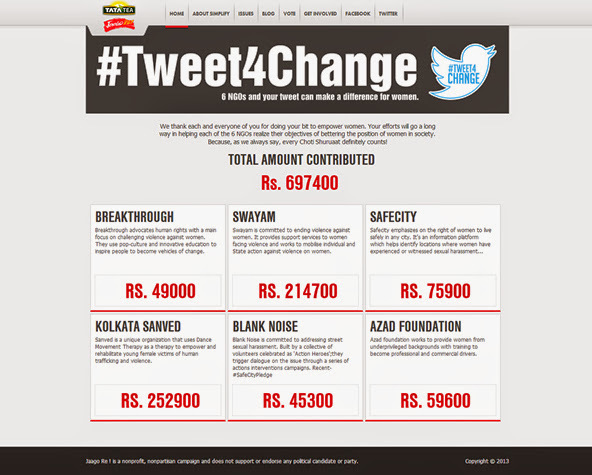 The latest from the brand is a 2-day Twitter promo #Tweet4Change hosted on 27th and 28th June on the Jaago Re Twitter Handle supporting 6 NGOs working in the area of women’s empowerment. The premise was simple - the fact that we can make a substantial difference with every small step we take. The execution and flow were also simple and easy to understand. Participants needed to head to the neat Jaago Re #Tweet4Change webpage, select an NGO that they wanted to support and tweet. Tata Tea pledged INR500 for every tweet. The campaign was triggered through 'Promoted Tweets'. Social media is an obvious choice to activate direct engagements and TATA Tea leveraged this 2-day promo to engage its target audience on Twitter. The brand is now contributing more than INR6.9lakhs to these NGOs. Wonderful initiative!